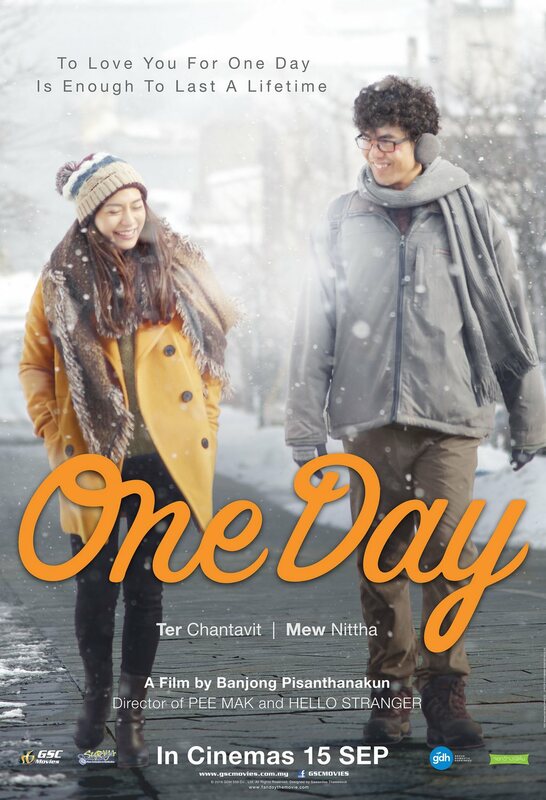 ONE DAY is a love story between Denchai (Ter Chantavit) and Nui (Mew Nittha). Denchai is a 30 year old geeky IT officer who has been treated invisible his whole life. He is in love with his colleague Nui but never had the courage to express his feelings towards her. He finally got his chance when the company went to Hokkaido for a company trip. He made a wish to be together with Nui for just ONE DAY, and his wish came true! What happened during this particular ONE DAY and what will happen after ONE DAY? Will you risk everything to be in love for just ONE DAY? Is being in love for ONE DAY just enough? This is a sweet story any one (guy or girl) who have ever had crushes would hope to have it happen to them (or not). While Thai films are often known for their horror genre, I love their comedy and romance films as they often weave finely between realism and fantasy. Here, ATM and Hello Stranger actor Ter Chantavit is back to fulfil the dreams of all geeks – dating your goddess for a day. Believe it or not, I was once a Miss Invisible-Geeky before. I was someone whom people ask out, out of politeness. I rejected because I know they didn’t really want me there. The inferiority, the disappointment and the invisibility is pretty real. Denchai (Ter Chantavit) did a really good portrayal of a geek who isn’t comfortable with people treating him well or around girls. Beauty and the beast, this concept isn’t new, so why is this a must watch? Aside from the gorgeous Hokkaido scenery, I think what made the film interesting was how the director brought out the difference in reaction towards the same words or actions when the feeling towards a person is different. When you like that someone, him noticing little details about you is sweet. When you don’t like that person, him knowing your little details become creepy and stalk-ish. Some people might find the part where Denchai made a wish and it came true with the condition of a temporary memory loss (Transient Epileptic Amnesia) a little far-fetch. While I agree to a certain extent, I had experienced moments when my wishes came true, and that added a hint of romantic fantasy to this harsh situation. The little side story with the company’s married boss “Top” (Tui Teerapat Satjakul) was an interesting perspective to relationships. Nui has a open secret affair with Top, and the Hokkaido company trip was an opportunity for them to openly go out together. Rather than providing an ugly outlook towards adultery and being the mistress, Denchai compared holding onto that act as an attempt to climb Mount Everest. The best thing about this film was how it didn’t try to over romanticise the situation and provide the audience with unrealistic endings. It is a nice film that provides some light-hearted food-for-thought topics for discussion after watching. If you are Denchai, what will you do after this whole episode? Banjong Pisanthanakun’s One Day is the debut slate of new Thai production house GDH 559, following the breakup of GMM Tai Hub (GTH) last year. As he wanted to be more touching and romantic (than comedic), he had a hard time holding himself back as he was used to putting in as many comedic elements as possible. The story was inspired by a neurological condition called ‘Transient Epileptic Amnesia’, also known as (TEA). Lucky ’N Love Bell (Niisa Bell) featured in the film sits atop “Asari Peak” in Kiroro. Built in 2006 as one of 100 government-established attractions, it is used as a popular lover’s sanctuary for proposals. It is said that couples who ring the bell twice are destined to be married. For this geeky role, Ter – Chantavit Dhanasevi gained almost 10 kg, permed his hair, and wore specially-made uneven false teeth to play a geeky IT officer ‘Denchai’. He also co-wrote the script for this film. As the shoot was carried out in Hokkaido, Japan, the team was greeted with -20°C on day one. Ter Chantavit said that his tongue went numb after a while, and his co-star lost her voice. Check out One Day Thai Movie (แฟนเดย์ แฟนกันแค่วันเดียว) Official Website and Facebook Page! One Day Thai Movie (แฟนเดย์ แฟนกันแค่วันเดียว) is out in cinemas on 27 October 2016. We wish to have a part 2 of this movie which both of them live happily ever after. As they fight for their love. Love it. We will be waiting for its sequel. We hope that it will happen soon. I love this movie as a Japanese living in BKK. I just wish that the director would at least leave us some idea of where were Nui going off when she cried after watching the video. I hate suspense! Wow, I liked the story idea a lot…Love story with a twist is always worth a watch. Actors seem to have worked really hard for the movie. I am liking the story line and it will definitely bring us back to younger day. Thanks for the lovely review as I wasn’t aware of this movie. I want to see this movie. Though the plot seems to be familiar. I could surmise what happens in that “one day” getting together for an introvert kind of IT wizard. How he unfold his love to his dream girl. It entails a romantic scene and how they accept their feelings for just “one day”. One day seems to be eternity for lovers like the two. They don’t want to have another day for that momentous event. Wanna bet? I like the concept of the One Day and how the chance to spend a full day on your wish. It shows us the importance of a day. It’s nice that they made it realistic. U know, I agree with Steph. Only the amnesia plot and the open ending that reduce the movie’s score. Love the acting, the writting, and the cinematography. Sounds interesting. I would want to watch this movie because of Hokkaido, though. I often watch films not for the story but for the setting. I hope to visit Japan soon. 🙂 But the story seems something I’d also like to see how it will unfold. This sounds like a lovely film and its so interesting to me how Chantavit really dedicated himself to the role with all the changes he made to his appearance (false teeth?!). Seems like a sweet love story, I know there were times when I was younger that I would’ve loved to have one day with my crush. Great review, love!